A phone that looked like a mixture of Oppo R17 Pro and the Oppo R15 appeared on TENAAand later on Geekbench with a Snapdragon 660 chipset. It has a tall 19.5:9 screen ratio with Full HD+ resolution, and now, thanks to a leaked live photo we can add a waterdrop notch to the picture. 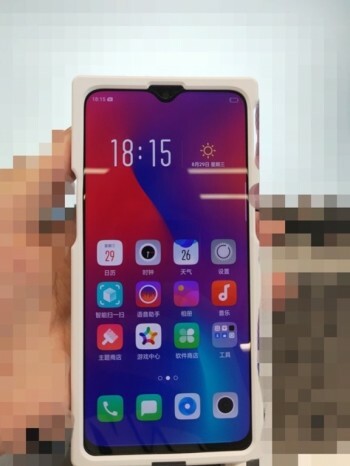 The picture of the phone, allegedly called Oppo K1, is in an industrial case to protect the phone from spy shots. Obviously, it works only slightly since we can see it will come with a huge screen and the latest Color OS. The picture does not reveal much, but looking at all the gathered images so far, the device appears to be an Oppo F9 unit without the fingerprint scanner on the back. This means the sensor will likely be under the screen, positioning itself between the F9 and the R17 on the price scale. Oppo is having an event on Wednesday and that’s when we’ll get the complete specs.